Enter for your chance to see Fathom Events The Royal Opera House Ballet for the second event of 2015! Broadcast from London’s Covent Garden, watch as Britain’s largest ballet company portrays the magic of the beloved classic, Swan Lake, on Thursday, March 19 at 7PM at a theater in the Salt Lake City area. Email your name, mailing address and contact phone number to FathomEventsSLC@gmail.com with the subject line “SWAN LAKE” for your chance to win a pair of passes. Entry deadline is Tuesday, March 17 at 5PM. 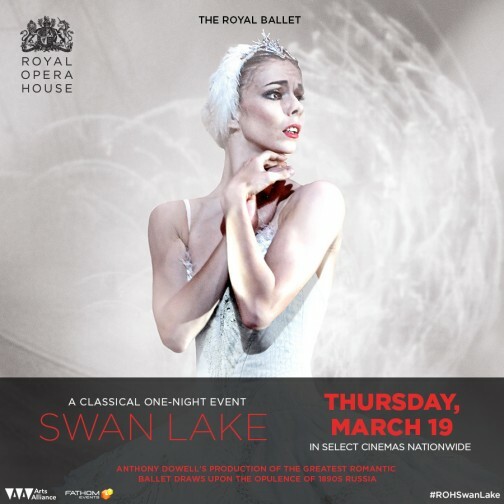 Visit fathomevents.com/event/roh1415-swan-lake to purchase tickets or check out participating theaters in your area! Good luck! Tickets are good for one admission at the pre-specified theater chain on 3/19/2015 and guarantees you a seat at the theater until ten minutes before show time. Passes need to be exchanged at the box office. Tickets cannot be exchanged, transferred or redeemed for cash, in whole or in part. Late and/or duplicate entries will not be considered. Limit one entry per household. Winners will be drawn at random and notified via email with how to claim their prize by 3/17/15 at 5PM. No purchase necessary.